Dream Pod 9: Kickstarter Update: Wave 4 UK & EU Backer Reward Packages Have Shipped! 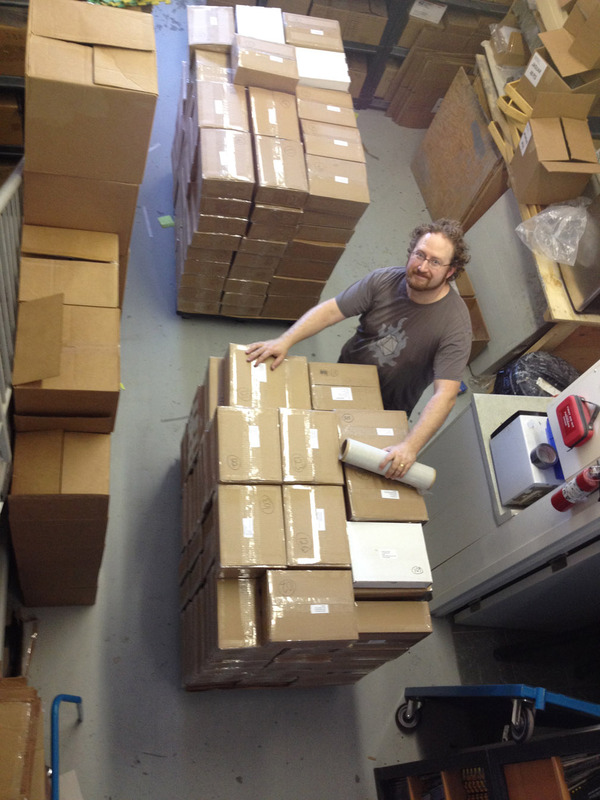 We finished packing up all the Wave 4 Backer Reward Packages this week. On Thursday afternoon TNT Express came by to pick the two skids of UK and EU Backer Reward Packages that are shipping by air freight to our forwarder, Wayland Games, in the UK. They should receive the skids later next week once they have reached the UK and cleared customs. Then the staff at Wayland Games will add the needed Royal Mail postage to all pre-labelled and boxed Backer Reward Packages and drop them off at the post office. UK and EU Backers should start receiving their packages the week of October 10th, 2016. Checkout the attached photo, of Dave with the 2 skids of 195 UK and EU Backer Reward Packages weighting in at 316 KG (695 lbs.) total, before he wrapped them both up with stretch wrap. We are shipping the last of the Wave 4 international backer packages and a few stragglers this Friday and then all backer packages, that had their shipping paid will have been shipped. We still have 10 backers that need to get their shipping paid and then they will be shipped and the first Kickstarter will be completed. If your one of those 10 (1 American, 3 Australian, 6 British) check your emails and try to get the payment in as soon as possible and well get the reward package mailed out. Thank you all for your amazing support of our first Kickstarter. Home › Blogs › Robert Dubois's blog › Kickstarter Update: Wave 4 UK & EU Backer Reward Packages Have Shipped!